Periodicity of Good and Bad Seasons. MR. H. C. RUSSELL’S THEORY. The paper lately read before the Royal Society of New South Wales by Mr. H.C. Russell, the Government Astronomer, a condensation of which has already appeared in the ” Queens lander,” has excited so much interest and so much discussion that no apology is needed for returning to the subject. With the view of affording our readers as full an insight as possible into the grounds upon which Mr. Russell has based his conversion to the theory of the nineteen-year cycle we reproduce the complete paper, as published in the ” Sydney Mail,” with the accompanying diagrams. It will not be a surprise, therefore, if you feel the same, but I hope you will give me a fair hearing before coming to a conclusion, so that yon may have before you the evidence that has convinced me, and you can then form your own opinions. I am not unaware of the fact that there is a great gulf between having enough evidence to convince oneself and being able to produce enough evi dence to convince an audience, but the statement has not been made until there seemed to be evidence enough to convince anyone who will carefully weigh it. Moreover, an endeavour has been made to put the evidence in such a form that it can he easily followed by all ; to me it seems to be conclusive, but probably most of those who hear will wait to be convinced by the result of the forecasts, and to meet this very natural feeling there will be tonight a forecast of the seasons for the coming two years. The difficulty in getting the facts together is very great. I have had to ask from history records of passing phenomena, which it has been the habit of the historian to neglect; however, there will be before you a mass of evidence in support of my pro position that there is a periodicity in weather. The argument of my paper is, that if we take 100 years of climate thoroughly studied, so that its salient features are clearly defined, and we compare this section of time with all past time, so far as the data are available, and find that the salient points in our century are repetitious of the salient points in all past time, and probably in all countries, then one is justified in coming to the conclusion that these salient points are definitely connected with the climate of the world, and will appear again regularly in the future. The weak point is freely admitted—namely, that history has not kept a regular and continuous account of droughts, but only recorded them when they became very prominent. The strong point is that all the data that history does give us is in favour of the nineteen years’ cycle. For in any years the subject of this paper has been constantly before me, and no opportunity has been lost of putting together facts which I hoped would one day clear up the difficulty. Scores of investigations have been carried out, some successful, others not so, in bringing forward evidence. My papers to this society on ” Floods in the Darling,” and ” Floods in Lake George,” and the careful study of the rainfall and general weather, and the diagrams of various weather records, barometer, thermometer, wind direction and force, and rainfalls of different Australian latitudes, from 1840 to 1887, have all been helps. All the usual weather cycles have been carefully studied. One that very many meteorologists accept, ” Sun Spots,” will be referred to later. And it maybe explained that the word drought is not used here in the sense in which it is often used in England and elsewhere, that is, to signify a period of a few days or weeks in which not a drop of rain falls, but it is used to signify a period of months or years during which little rain falls, and the country gets burnt up, grass and water disappear, crops become worthless, and sheep and cattle die. There are parts of the world in which you never hear of drought, but they tell you they have years of floods, and years of moderate rains, but nothing that can be called a drought, and yet we have in these variations of the rainfall exactly the same causes at work which make in another place a serious drought; that is, a variation in the annual rainfall, and in the temperature and winds ; but one place has a superabundance of rain and does not miss a small quantity, while “the other has barely enough at any time, and a slight variation makes a drought. The interior of Australia and many other places are of this character, and our coast districts have a fairly abundant rainfall which modifies the drought conditions, and relatively we have little drought. In other words a drought is nothing if it has not a suitable local setting. Drought is, however, not wholly made by a shortage of rainfall. Its most important factors are great heat and drying winds. As an illustration we may look to the year 1595 ; in the latter part of winter and in spring there were many falls of rain, which would have made grass in ordinary seasons, al though there was not as much as usual, lint it had no sooner fallen than a dry north-west wind and burning sun dried il all up. This great and “burning heat was a well-known feature in historical droughts, and some authorities say that the fable of Phaeton driving the Chariot of the Sun so close to the earth that he set it on fire is a poetical setting of an actual experience in Greece when the sun became so powerful that the heat was almost beyond endurance. Before 1895 all the diagrams On page 1222 had been made to show quantities of the various elements, and their relation in time with a view to seeing if there was any pediodicity. Recently it occurred to me that it would be useful to have a diagram in which all the droughts, without regard to their in tensity, should be placed in their order of time. Not only was this desirable for seeing what the relation in time was, ‘but it had become evident that it would be impossible to see the relation between our droughts and those in other (countries unless some such pictorial arrangement was made. At the time it was not seen what a great saving of trouble and time this very simple device -would insure, but it is abundantly evident now that this diagram has shortened by some years the attainment of the object I ‘had in view. As a preliminary to making the diagram, the particulars of the weather in this colony from all sources, for every year of our history, were carefully examined, and the years simply classed as good or bad—that is, having sufficient or insufficient rainfall; a form was then prepared with a vertical space for each year, and across these a zero line was drawn to divide the good from the bad ; and, beginning with 1895, I filled in for that year, and below the line a’ convenient length of the column in red ink.” The length was simply to catch the eye; then for 1894, a good year, I filled in with black ink above the line-a space equal to the red in the vertical space for 1894. The two years we’re thus contrasted, simply as good and bad ; the question of how good or how bad was purposely left out. The diagram was then completed, each year being treated in the same way back to 1788. It was at once apparent that the drought which had been lettered A for convenience was the most regular in its recurrence, and the most extensive in time, lasting as it does from three to seven years. A vertical red line was then drawn through A between the first and second years, and it was found, that the inter val was regular and exactly nineteen years. Drought D was then examined, and found to recur with nearly the same regularity, and a short vertical line was drawn under it to mark the point which has been taken as the centre, and this also recurs at intervals of nineteen years, but it must be borne in mind that there is a D between each pair of A’s, and that from A to D is ten years, and from D to A nine years. There are three others, B, G, and E, which, also recur with an average interval of nine teen years, but they are not quite regu- lar—may, in fact, differ; time to time a year,’ or even two years. This uncertainty of time is indicated in the diagram by making the red space Shorter. The diagram takes in the whole period from the foundation of the colony to the present year—i.e., 108 years —and it is certainly very noteworthy that the most pronounced droughts recur with such regularity—that is, at every nineteen years throughout the 108 years. It had been observed by me years ago that some of our great droughts had been world-wide, and when the diagram had got so far it was decided to fill in the Indian droughts on a lower line, and see if they also coincided with Australian ones, and you see the result. Strange to say, I find no record at drought in India in 1846-7, but I remembered the great drought in Ireland and England of those years corresponded with ours. The investigation had become interesting, and seemed to promise to show the exact year of the great drought in this country, of which there was abundant evidence when the colonists landed here, both in the fact that to the south of Sydney all the very large trees were dead, and between them were growing young trees, and the story of the blades, who said that the river Hunter dried up, that all the great trees died, and most of the blacks; that those who survived had obtained drinking water from the mountain springs. I had long wanted to find out when this terrible drought in the colony took place, and the Indian record showed that the A drought had been repeated in 1769, which probably fixes the date, for the middle of the 18th century was very dry generally all over the world. But, if we can carry the nineteen years’ period in this way back beyond our history, the idea immediately presents itself, where are you going to draw the limit ? Is there any limit? It was evidently not a question for argument, but for proof, or disproof, by figures. It was recollected at the moment that ‘history records a terrible drought and famine in India in 1022. and there was a similar one in South America about the same time. Does it lie in the 19 years’ cycle? was the question which naturally presented itself. And it was seen that it did, for 19 multiplied by 43 takes us back from 1838 to 1021, that is, to the repetition of D drought, and on the spur of the moment the differences of opinion about the accuracy of [… ….] was ignored, and the figures were run out to see if the the seven years’ famine in Egypt 1706 B.C. was in one of our 19 years’ cycles, and sure enough, 19 multiplied by 187 takes us back to 1705 B.C., or within one year of the date of Pharaoh’s famine. But Pharaoh’s drought may for the present be discarded, to appear again later. The fact that one famine in 1022, When dates may be taken to be reliable, should fall into the cycle was enough to suggest further investigation in reference to other recorded droughts; and all the records of droughts that had been collected in the last twenty years of general reading were tested to see if they fitted in. Tables were prepared showing every date on which A drought recurred back to A.D. 1, and the same for drought D. I am not going to weary you by going through the list, but will give you the result. History says very little about droughts prior to A.D. 900. Be tween that date and this A drought has, on the assumption, occurred at every 19 years. In this interval of 996 years there have been fifty-two repetitions of A drought, and the question is, what has history to say about its droughts. Well, it shows that these droughts have been repeated at various places on the earth on fourty-four of the fifty-two dates. Of these eight missing droughts no less than six occurred between 1000 and 900 A.D., an interval when history was less complete, on these markers. So far as I have gone, history furnishes us with seventy-eight droughts, in different countries, all of which fit into the series which we have named A. Dur ing the same period D recurred fifty one times, and history records; droughts, numbering eighty-nine^ on thirty-six of these periods. Taking then the droughts history has recorded between A.D. 900 and 1896, we have seventy-eight A and eighty-nine D, a total of 167 out of 208 on record. But this is not all, for the drought’ E which-is irregular in Australia, seems to be more definite and important in the Northern Hemisphere, and twenty-six more out of the 208 fit into E series, making up the number to 193 out of a total of 208. In estimating the importance of these figures it must be remembered that before 1788 North and South America, Russia, China, Persia, Turkey, Austria, and Australia, all subject to frequent drought, yet did not, however, furnish to the numbers quoted more than you could count on your fingers ; and it may be fairly assumed; that if we had these records, and especially if history had made a point of recording droughts, we should have had drought recorded on every recurrence of the A and D 19 years’ cycle. But I think the evidence that history furnishes 188 droughts, every one of which fits into the cycle, justifies us in assuming that the 19 years’ cycle has been running for at least 1000 years; and may be trusted^to continue,^ and justify forecasts based upon it for some time to come. Having got so much from a study of A arid D in the Christian era, it seemed desirable to see if there were any re corded in B.C. times, and the following were found. :—One drought in Abraham’s time, given as 1920 B.C. does not fit. into the cycle. 1. Gen. xxi, 1, in the time of Isaac, 1804 8.C., 3652 years before D, equals 19 multiplied by 181 plus 3. 3. 11. Sam., xxi., 1, David’s time, 2849 years before A, equals 19 multi plied by 150 plus 1. 4. I. Kings, xvii., 1, Elijah’s drought, 2736 years before A, equals 19 multi plied by 144. 5. 11. Kings, viii., 1, Elisha’s drought, 2717 years before A, equals 19, multi plied by 143. You will observe that the interval between 4 and 5 is 19 years, between 3 and 4 is six times 19 years, between 2 and 3 36 times 19 years. 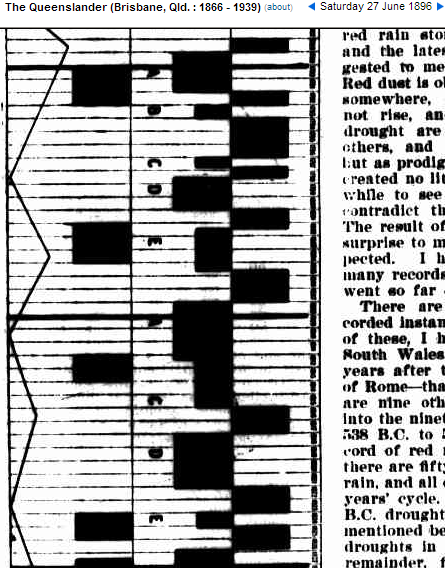 These intervals in which our droughts are found repeated are surprising, but I am not unaware of the differences of opinion in regard to chronology, but take the dates as given, and it is remarkable how exactly they fit in. Those learned in Assyrian antiquities tell us that the book containing “The Observations of Bel,” the oldest astro nomical book of that part of the world, was ordered to be kept by the King, 3800 years B.C. ; that the book shows that they kept a record of astronomical and all other events, that they had discovered the nineteen years’ cycle of eclipses, and we are told that it was a doctrine with them that one event caused another, and all astronomical and meteorological observations were thus bound up together. Under such conditions, I do not think it would be possible for them to avoid finding in the droughts a similar period to that in the eclipses—i.e., nineteen years—but even if they did it would have been impossible for those who kept the Nilo meter in Egypt to avoid finding it in the heights of the Nile floods, which were of such vital importance and so carefully recorded. Having got so far, I looked for any droughts mentioned in Roman history, to see if they would coincide like the others with the nineteen years’ cycle, and found two—one in 493 and the other in 436 B.C. In both cases these are repetitions of the A drought, but the historian has quoted the end of the drought, for they are three years after my date, which is the second year of a drought that lasts from four to seven years. It is said that in 138 B.C. there was a drought over the whole world. The heat is said to have been excessively great, and to have given rise to the fable of Phaeton setting fire to the earth. Be that as it may, it is an exact, repetition of D drought, and its most marked feature, the intense heat, is the most marked feature of a D drought to-day ; witness the excessive temperatures of January last, and the record temperature of Australia —127deg. [52.8C] at Bourko—was nineteen years ‘before, in 1877. We thus see that five out of six Scripture droughts fit into the nineteen years’ cycle, two from Roman history, and one from Grecian, in all eight B.C. droughts agree in supporting the cycle. The evidence of these droughts is very strong, because it is so nearly unanimous ; and, as we shall see presently, it receives support from an unexpected quarter. In passing, I may mention that the interval between the dates 493 and 436 is fifty-seven years, or three times nineteen. Since I ,have been working at this subject there have been a number of red rain storms noted in this colony, and the latest, on the 10th April, suggested to me this line of investigation. Red dust is obviously a proof of drought somewhere, otherwise the dust could not rise, and, since these proofs of drought are entirely apart from the others, and recorded not as droughts hut as prodigies, which in days gone by created no little alarm, it will be worth while to see how far they support or contradict the nineteen years’ cycle. The result of this resolution came as a surprise to me, because it was so unexpected. I had no idea there were so many records of red rains, or that they went so far back in history. There are altogether sixty-nine recorded instances of the fall of red rain : of these, I have recorded six for New South Wales. The first was fourteen years after the foundation of the city of Rome—that is, in B.C. 738—arid there are nine others B.C., all of which fit into the nineteen years’ cycle. Between ~>38 B.C. to 582 A.D. I can find no record of red rain, but from 582 to 1896 there are fifty-nine recorded falls of red rain, and all of them fit into the nineteen years’ cycle. We have here, then, ten B.C. droughts which go with the eight mentioned ‘before to make eighteen B.C. droughts in support of the cycle ; the remainder, fifty-nine, are included in the previous list. The NOAA uses a 19 year cycle for tidal data collection. for what it is worth N.C had a pretty bad drought in 2007. It killed a lot of grass pastures and hay had to be trucked in from out of state. Looks like we are not due for another drought until 2026. The unraveling of the Chaco society began with a drought in 1130 A.D. Lack of rain depleted the storehouses and made the farmers question the power of the Chaco priests. The Chaco Phenomena was over…. After 1150 A.D., the Mesa Verde area of the San Juan Basin had the largest number of people in the Southwest. Increases in the number of people in cliff dwellings reduced the inhabitant’s ability to raise enough agriculture products to feed themselves. Around 1276, a long drought began that continued until the end of the century. Even without a drought, trying to raise enough food on the mesas and getting water out of the canyons played a big part in the abandonment of the Four Corners area…. Mikey Mann’s bristlecone pines show not only the Medieval Warm Period but the Roman Warm period!!! Oh, the horror to be betrayed by a tree! University of Arizona’s Laboratory of Tree-Ring Research has revealed a previously unknown multi-decade drought period in the second century A.D. The second century A.D. saw an extended dry period of more than 100 years characterized by a multi-decade drought lasting nearly 50 years, says a new study from scientists at the University of Arizona…. To develop their chronology, the researchers looked for indications of climate in the past in the growth rings of the oldest trees in the southern San Juan region…. “We did a lot of hiking and found a couple of sites of bristlecone pines,…. “In our chronology for the south San Juan mountains we created a record that extends back 2,200 years,”…. The chronology extends many years earlier than the medieval period, during which two major drought events in that region already were known from previous chronologies. However Cody Routson was a Doctoral candidate of the environmental studies laboratory at the University of Arizona’s department of geosciences during this study in 2011 so he had to tack on the CAGW get out of pee-review free scare card. Although natural climate variation has led to extended dry periods in the southwestern U.S. in the past, there is reason to believe that human-driven climate change will increase the frequency of extreme droughts in the future, said Routson. In other words, we should expect similar multi-decade droughts in a future predicted to be even warmer than the past. And that statement makes no sense – warmer is El Nino not La Nina and warmer is wetter – but it sure goes to help validate Kooks 97% doesn’t it? We know El Nino means warmer thanks to the 1997/98 super El Nino and corresponding peak global temp. It is why Warmists are praying for another Super El Nino to break the pause. Here is the El Nino = wetter for USA southwest. For us in the desert Southwest, the long-term forecasts are calling for a chance of above-normal rainfall for the months of June through September. This chance of precipitation being above average even carries into the winter months, and El Nino is still forecast to develop. What is the main reason for these two forecasts? The main reason for the above-average rainfall into the winter months in the Southwest and the below-average hurricane season is El Nino. During El Nino years, the storm track takes a more southerly route over the southwestern United States, generally leading to additional rainfall for Arizona and much of the southern United States. Millennial climatic events fit with our solar-planetary theory too. “To be continued.” Pleasecan we have the remainder of Russell’s excellent paper. A packet of biscuits to anyone who can find it. The “To be continued.” ended the original 1896 newspaper article. Second part found via NLA Trove. Where are my bikkies? Periodicity or Good and Had Seasons.